So. My father sent me yet another chain-email today. I expected to scroll down to find some image soaked with bêtise, stupidly funny or “cute” or “frightening.” Instead I found this. 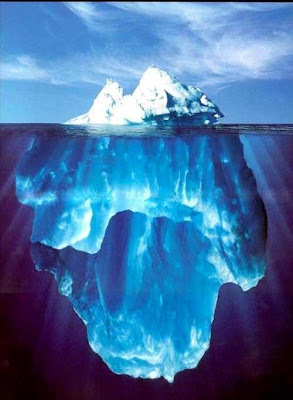 Subject: EVER SEE AN ICEBERG FROM TOP TO BOTTOM? This is awesome! This came from a Rig Manager for Global Marine Drilling in St. Johns, Newfoundland. They actually have to divert them away from the rig by towing them with ships! In this particular case the water was calm & the sun was almost directly overhead so that the diver was able to get into the water and click this pic. Clear water huh? They estimated the weight at 300,000,000 tons. And now we know why they say one picture is worth 1000 words… And now we also know why the Titanic sank! Now for the forum part. Please explain – succinctly, of course – why it is that I find this image so disturbing. « it could happen to you…. it’s the grotesque underbelly’ of an engorged suspended turd. No, Matt, that can’t be it. Mine don’t float. It’s the discontinuity between visible and invisible. Somehow the two pieces of this image don’t fit together; we expect to find the submerged part linked in some organic way to the floating part but it isn’t. ah, much, much better… That sounds just about right. Would you be interested in being my therapist? Do you have any slot open on Wednesdays? I think I suffer from some sort of base/superstructure related dysfunction.